The PEAKS development team has developed a solution to address MultiNotch MS3 Quantitation, currently in use by Proteome Sciences for biomarker discovery. MS3 provides more accurate quantification for isobaric tagging experiments, specifically improving TMT and iTRAQ based studies. In 2011, Gygi et al. reported isobaric labeling mass spectrometry–based proteome quantification commonly suffers ratio distortion owing to protein quantification interference.1 A more recent publication by the authors identifies that the combination of quantitative isobaric reagents and the MultiNotch MS3 method improves the dynamic range of reporter ion quantitation, reducing reporter ion signal variance, and ultimately produces more high-quality quantitative measurement.2 Our development team implemented a data analysis solution to address these points in order to generate more sensitive and accurate results for end users. The MultiNotch MS3 quantitation solution is currently in use by Proteome Sciences. Earlier this year Methods published an article entitled Using Hydroxyl Radical Footprinting to Explore the Free Energy Landscape of Protein Folding. The article provides guidelines to ensure best practises when protein mapping using the emerging technology called fast photochemical oxidation of proteins (FPOP). 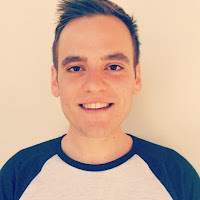 Recently, BSI spoke with lead author, Dr. Antonio Calabrese from the University of Leeds to discover more about his research. Understanding structure, flexibility and dynamics of side chains in different protein conformers is critical to structural biologists. While very successful for other applications, nuclear magnetic resonance (NMR) is limited in its ability to perform direct comparison on partially folded proteins due to conformational exchange; thus other methods are required. The lab is very interested in method development, developing new techniques and applying a variety of mass spectrometry technique to study protein structure. We also work with native mass spectrometry and chemical cross-linking and so… labeling with hydroxyl radicals is complementary to hydrogen deuterium exchange (HDX). One of the things different about it is because you have a covalent label you can be a bit more rigorous with your downstream sample handlings. Within the realm of protein mapping, a significant interest of the group is surface mapping. To accomplish this, the surface area of a protein is labelled with hydroxyl radicals; opening the opportunity to identify labelling sites at the amino acid level and perform quantification on the observed oxidation. The thing that is rather complex about the data that you get out of FPOP is that generally speaking you are looking at modifications which are quite lowly abundant and so being able to reliably quantify those levels of oxidation and quantify those modifications is often quite challenging; especially if you want to analyze your data in order to obtain very specific information…. We used PEAKS to help assign our modification sites and then we also had to manually validate, specifically the modification, sites. 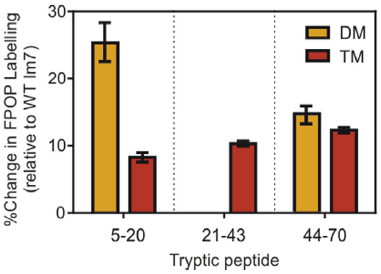 Peptide level quantification of oxidation levels. The automated results were definitely quite good. Whenever we manually validated those automated results they were pretty much spot on. When results are right it is obviously much easier to work with. Also, the capacity to look at the de novo spectra means you have got a lot more data to play with; otherwise much of it just gets thrown away. […] Now we are using it routinely for all of our DDA data analysis in the lab. As with many other emerging technologies, the project is set to progress onto other complicated systems where it can continue to be complementary to HDX. We have just looked at some relatively simple systems [soluble proteins], but now we are starting to look at more complicated systems using the techniques; so now are starting to look at characterizing membrane proteins which are obviously a lot more challenging and trying to optimize everything now. We are grateful to have had the opportunity to speak with Dr. Antonio Calabrese and receive insight into emerging methods that dig deeper into explaining our proteomic world. For those interested in learning more about the PEAKS software, regularly scheduled public webinars are available for free with our support team here. The PEAKS Training Workshop is coming to Stanford University (Stanford, California) on August 24-25. The Training Workshop provides a full hands-on experience with PEAKS 7.5 for both new and experienced users of PEAKS Studio. In addition to demonstrating the logic and algorithm behind PEAKS software, the workshop focuses on how PEAKS may be used specifically toward the users’ research and applications. Participants of the course can expect to increase their knowledge of LC-MS/MS data analysis and result validation upon completion of the course. Visit our training website for more details and to sign up. Fast and Accurate Unrestricted Spectrum Interpretation: You Don’t Know What You’re Missing. A significant list of oral presentations and posters relevant to PEAKS users are available on our ASMS 2015 webpage. Our own poster, Peptide Mapping for Quantitative Profiling of Peptide Variants using PEAKS is also available. The purpose of this year’s ABRF iPRG study was to evaluate different data analysis methods for relative protein-level quantification in label-free proteomics. In conclusion of the study, PEAKS label-free quantification proved to successfully demonstrate a high-level of accuracy in determining relative protein abundance. Graphs from the results were retrieved from the ABRF iPRG Preliminary Results Summary. To view the full Preliminary Results Summary, please use the link provided below. 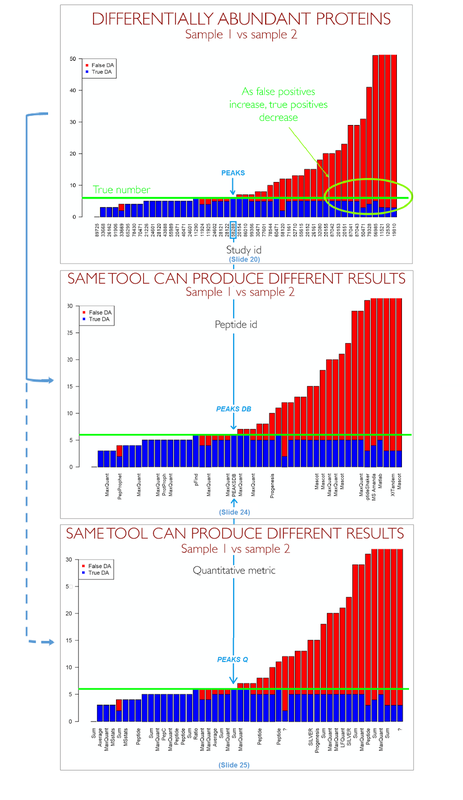 The first graph shown is an overview of all the participating Study IDs in relation to their results as seen on slide 20 in the Preliminary Results Summary. The same graph is then presented again on slides 24 and 25 (zoomed in), to show the specific tools used for peptide ID, as well as quantification for each submission. .
Of the 51 submissions, very few were able to recognize the true differentially abundant (DA) proteins, as seen in the graph. PEAKS, however, recognized all 6 true DA proteins (represented in blue), and reported 0 false DA proteins (represented in red). Participating researchers were required to detect and identify proteins that changed in relative abundance among four biological samples, prepared from the same S. cerevisae yeast cell lysate. To truly focus on the statistical assessment of the varying data processing approaches, the peptide identifications and their associated integrated peak intensities were provided to all participants. Come by and visit PEAKS at this year's DGPF: Proteomic Forum (booth 19). The conference will be taking place March 22-25 at the Technical University Berlin (Germany). In addition, PEAKS will be hosting a Training Workshop, March 19-20, 2015, at the Crowne Plaza, Berlin City Center. The workshop is designed to give users a hands-on approach to fully understanding the capability of PEAKS. Visit http://www.bioinfor.com/ for more information and registration.